What are in-lays and on-lays? Inlays and Onlays are lab-made restorations that are placed on your teeth when the cavity or lost tooth structure is too large to be restored by a simple filling. The process of making an inlay is very similar to a dental crown. After the tooth is prepared, it is cemented or bonded to the tooth. There are many different materials that inlays can be made of, including gold, porcelain, and composite resins. Here at Santa Monica Esthetic Dentistry, we offer porcelain and composite inlays and onlays as cosmetic alternatives to fillings, because they are much stronger in comparison to regular white fillings. Gold inlays and onlays are also suitable alternatives, but their appearance makes them less popular. In general, inlays and onlays can replace most back teeth fillings and are often cosmetically preferred over conventional fillings. Both inlays and onlays are more conservative than crowns. Since the process of making an inlay or onlay is similar to a crown, its cost is also comparable. 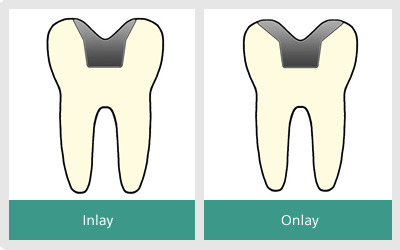 When considering the longevity of inlays and onlays, they often end up costing less than traditional fillings. For more information or to determine whether you are a good candidate for an inlay or onlay, contact our office at (310) 458-4000 to schedule a consultation at your earliest convenience.